Our daughter-in-law is careful to pack a variety of our granddaughter Molly Kate’s favorite toys and books for overnight trips. Molly Kate, now two and a half, also creates her own toys. On the road to our recent stay in Destin, FL, Molly Kate entertained herself during a Cracker Barrel stop for dinner. 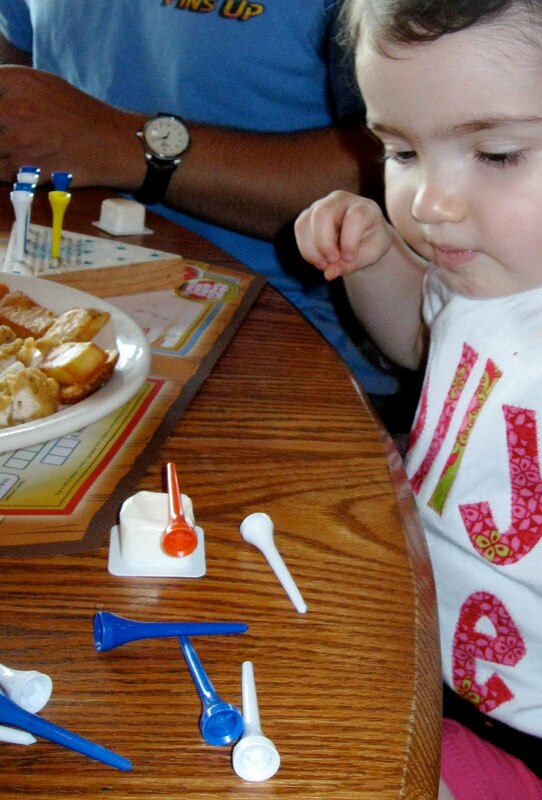 While the three adults chatted and dealt with her little brother Walker, Molly Kate latched on to the classic peg game that is standard on all Cracker Barrel tables. After awhile I tuned into her quiet monologue. She had upended an individual-sized butter tub and had laid one of the colorful pegs across it. She was describing and acting out the peg’s visit to the doctor. 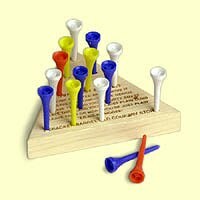 The peg had come in from the waiting room and was up on the “counter.” In her professional medical role, Molly Kate was taking weight and other measurements. I barely managed to contain my laughter and surreptitiously pull out my camera. Could there be a budding playwright in our future? She reminded me of the early childhood of my own children, Molly Kate’s daddy Jeremy and her Uncle Walt, our oldest son. Although Jeremy says I would give them sticks and throw them under a bush to play, that is not quite accurate. Both guys had a penchant for turning ordinary objects into elaborate weapons or other tools they deemed necessary for their imaginary adventures. On one trip to the Smoky Mountains, Jeremy whittled a little on a stick to use as a handle, tied a long string to it and played for days with his “whip.” We returned home and shortly afterward, he entered first grade. One afternoon I noticed he had a portable radio that I hadn’t seen before. The story I pieced together was some days earlier he had traded the homemade whip for it. I called the mom of the new owner of the whip to alert her and arrange for return of the radio. To this day, Jeremy still has a generous helping of Tom Sawyer in his personality and regularly exercises his ability to engage others in whatever is currently igniting his enthusiasm.